Scarlets chief executive Mark Davies hopes the Welsh regions and the Welsh Rugby Union will soon be able to settle their long-running dispute. 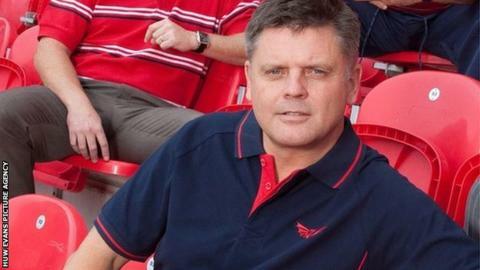 Davies is also the acting chief executive of Regional Rugby Wales, the body that represents the four regions. The regions have yet to sign a new Participation Agreement with the Union, with the current one set to expire on 30 June, but Davies remains hopeful. "We're both mutually reliant," Davies said. "As long as we both recognise that then there should be a way forward. "It's a discussion that's been going on over two years between ourselves and the WRU. Practically speaking it will take as long as it takes. "It shouldn't be that complex, there's only five parties involved. "So... if we can just concentrate on what we're trying to achieve by an agreement for both [sides] and if we can commit to each other's objectives in that sense, then it must be possible to reach an agreement that makes sense for all. "We've put any number of proposals to the WRU, but we've put our latest proposal to the WRU some time ago. "The WRU is aware of what we believe is workable and really we need to sit down and discuss that with the WRU rather than throw figures around in the public domain. "We've put a structure together we think can be very strong for both sides and that's the structure we need to discuss, and that's the resource we need to discuss." The Participation Agreement between the WRU and regions - Cardiff Blues, Newport Gwent Dragons, Ospreys and Scarlets - sets out the terms of such things as funding and the release of players for internationals. One particular stumbling block during the negotiations had been the future of European competition. But with plans for next season's European competitions agreed, Davies hopes that can help defuse the row between the Union and the regions. "The relief is, from a business point of view, now we can commit season tickets to our supporters, now we can commit to our sponsors, so now we can function as a business," Davies added. "With all of the other clubs [in England and France] going forward as well that's not going to be enough, so the reality is we need to focus on an agreement [with the WRU] that works as well. "Whether that makes us stronger or not debatable, I guess it gives us more time because at least we know what we're playing in next season."